A blogger who has taken Labour MSP Kezia Dugdale to court remains "deeply distressed" by her claim that he sent a "homophobic" tweet, a court has heard. 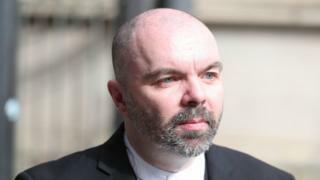 His lawyer said it was both "untrue and unfair" to describe Wings Over Scotland blogger Stuart Campbell as a homophobe. But Ms Dugdale's QC said the pro-independence blogger was happy to fire "poisoned arrows at anyone he chooses". He said Mr Campbell should therefore "not complain when an arrow is fired back". And he added that First Minister Nicola Sturgeon, Scottish Secretary David Mundell, Scottish Greens co-convener Patrick Harvie and Stonewall Scotland director Colin Macfarlane were among those to have agreed with Ms Dugdale's view that Mr Campbell's tweet was homophobic. The lawyer also said there was a "plain irony" in Mr Campbell suing someone else for defamation, given the caustic nature of his blog and tweets. The exchanges came as both sides summed up their positions on the third and final day of the civil proof at Edinburgh Sheriff Court. Sheriff Nigel Ross, who has been hearing the case, said he hoped to deliver his ruling within the next four weeks. Mr Campbell is suing former Scottish Labour leader Ms Dugdale for defamation over a column she wrote in the Daily Record on March 2017 which referenced his "homophobic tweets" and accused him of spouting "hatred and homophobia towards others" from his Twitter account. The tweet at the centre of the action was posted by Mr Campbell during the Conservative Party conference and said that Conservative MSP Oliver Mundell "is the sort of public speaker that makes you wish his dad had embraced his homosexuality sooner." Mr Campbell, from Bath in Somerset, has denied that it was a homophobic reference to David Mundell being gay, and has insisted it was "satirical criticism" of Oliver Mundell's public speaking skills. The blogger's QC, Craig Sandison, opened by telling the court that Mr Campbell "is not a homophobe", and was seeking to protect his reputation as someone who has consistently supported the equal treatment of homosexual people. He said being accused of homophobia would put a "stain" on a person's character and lower them in society's eyes. Mr Sandison told the court that his client "continues to be deeply distressed by that allegation and by the insistance by the defender on its truth". He acknowledged that Mr Campbell, who is seeking £25,000 in damages, "is not a polite man, he doesn't restrain himself in setting forth his views. He is not circumspect." But he argued: "None of those are aspects of his character he is seeking to protect by this action. "What he is seeking to protect is his distinct reputation as someone who has consistently supported equal treatment of homosexual people and indeed people generally. "That's why he is so upset, because this attack on him is so untrue, so unfair." Mr Sandison said that if anyone was "abused" by the tweet it was Oliver Mundell, based on his public speaking. He said: "That statement about Oliver Mundell wasn't based on his sexuality, it's nothing to do with his sexuality. Was David Mundell then abused because of his sexuality? I say absolutely not." He added that Ms Dugdale's comment was "not fairly made" and claimed it was motivated in part by her "ill feeling" towards the blogger because of articles he had written about her. On Tuesday, Ms Dugdale told the court that she had a responsibility as a gay politician to "call out" homophobia, and that it remained her "honest view" that the tweet was homophobic. Her lawyer, Roddy Dunlop QC, described the Lothian MSP as "entirely credible and reliable" and said the true question in the case was whether someone was entitled to view the tweet as homophobic. He said: "The pursuer (Mr Campbell) quite clearly does not like the defender. He has been extremely rude about her on multiple occasions and on the one occasion she calls him out, he sues her. "When he publicly tweets about two public figures, he is exposing himself to public comment and he has to thole that. There is a plain irony in the pursuer, a master of calumny, suing for defamation in this particular context. "This is someone who has entered the political arena of his own volition, armed with a quiver of poisoned arrows which he will fire at anyone he chooses. He should not complain when an arrow is fired back."